For almost half a century now (he’s written 49 movies in 49 years! ), Woody Allen has filled his films with some of the most cynical characters in all of moviedom. But even though he’s portrayed many of those misanthropes himself, his latest film, Magic in the Moonlight, shows that he can also be a big softie. 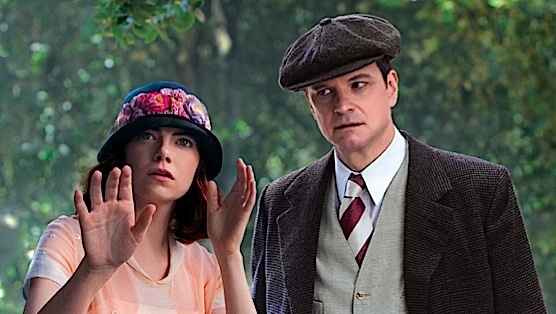 The movie is a throwback to romantic comedies of old with a gorgeous setting (the French Riviera), a seemingly heartless protagonist (Colin Firth’s Stanley), an idiosyncratic beauty (Emma Stone’s Sophie), a dullard of a rival (Hamish Linklater’s doting millionaire, Brice), and a set of circumstances that puts the two leads in opposition. A Midwesterner of modest means, Sophie is either a talented spiritual medium or a talented fraud. Proper English Stanley is a stage magician sent to prove the latter. But when he can’t, his own certainty that there’s nothing more to life than a preparation for the nothingness of the grave begins to crumble. Allen seems most interested in exploring how a belief in magic can provide life with meaning—even if the belief matters more than the magic. Stanley has nothing but scorn for the self-deluding masses who’d let themselves hope in religion or superstition or even his own illusions. The perfect woman for him is perfectly rational, one who can’t be fooled by a simple sleight of hand. But Sophie’s gift seems like proof that his rationalism is no less dogmatic than those he mocks. While they may not be Hepburn and Grant, Emma Stone is full of charm with a confident swagger, and Colin Firth is his usual mix of prickliness and intrigue. Each has a way of lingering on each other’s mind, no matter how they try to forget. And Linklater provides plenty of comic relief with his hapless wooing of Sophie, singing mandolin odes and attempting to grant her every material wish. The result is a delightful if slight tale of romance on the Riviera, an upper-middling entry into the canon of Woody Allen that will disappoint the cynics and charm those who like to let a little hope into their lives.